(Nanowerk News) A new technique developed at Berkeley Lab’s Advanced Light Source could help scientists better understand and improve the materials required for high-performance lithium-ion batteries that power EVs and other applications. The technique, which uses soft X-ray spectroscopy, measures something never seen before: the migration of ions and electrons in an integrated, operating battery electrode. Over the past several years, scientists have developed several ways to study the changes in a working electrode. These include techniques based on hard X-rays, electron microscopy, neutron scattering, and nuclear magnetic resonance imaging. But most of these methods track structural changes. They don’t track electron and ion dynamics directly, which is very important in the push to understand and optimize battery performance. 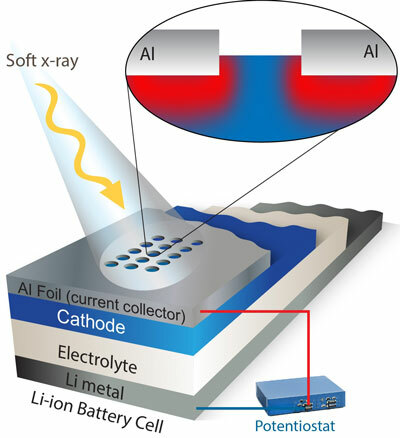 “In order to improve battery materials, we need to study charge dynamics in a complete electrode while it’s operating – and our approach does that,” says Wanli Yang, a scientist at Berkeley Lab’s Advanced Light Source who developed the technique with Gao Liu of Berkeley Lab’s Environmental Energy Technologies Division.